When the global financial crisis resurfaces, we the people will have to fill the vacuum in political leadership. It will call for a monumental mobilisation of citizens from below, focused on a single and unifying demand for a people’s bailout across the world. A full decade since the great crash of 2008, many progressive thinkers have recently reflected on the consequences of that fateful day when the investment bank Lehman Brothers collapsed, foreshadowing the worst international financial crisis of the post-war period. What seems obvious to everyone is that lessons have not been learnt, the financial sector is now larger and more dominant than ever, and an even greater crisis is set to happen anytime soon. But the real question is when it strikes, what are the chances of achieving a bailout for ordinary people and the planet this time? In the aftermath of the last global financial meltdown, there was a constant stream of analysis about its proximate causes. This centred on the bursting of the US housing bubble, fuelled in large part by reckless sub-prime lending and an under-regulated shadow banking system. Media commentaries fixated on the implosion of collateralised debt obligations, credit default swaps and other financial innovations—all evidence of the speculative greed and lax government oversight which led to the housing and credit booms. The term ‘financialisation’ has become a buzzword to explain the factors which precipitated these events, referring to the vastly expanded role of financial markets in the operation of domestic and global economies. 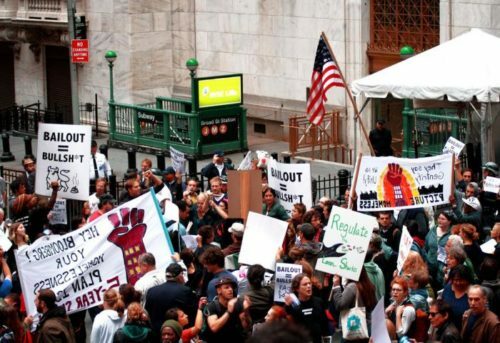 It is not only about the growth of big banks and hedge funds, but the radical transformation of our entire society that has taken place as a result of the increasing dominance of the financial sector with its short-termist, profitmaking logic. The origins of the problem are rooted in the early 1970s, when the US government decided to end the fixed convertibility of dollars into gold, formally ending the Bretton Woods monetary system. It marked the beginning of a new regime of floating exchange rates, free trade in goods and the free movement of capital across borders. The sweeping reforms brought in under the Thatcher and Reagan governments accelerated a wave of deregulation and privatisation, with minimum protective barriers against the ‘self-regulating market’. The agenda was pushed aggressively by most national governments in the Global North, while being imposed on many Southern countries through the International Monetary Fund and World Bank’s infamous ‘structural adjustment programmes’. A legion of books have examined the disastrous consequences of this market-led approach to monetary and fiscal policy, derisorily labelled the neoliberal Washington Consensus. As governments increasingly focused on maintaining low inflation and removing regulations on capital and corporations, the world of finance boomed—and the foundations were laid for a dramatic dénouement in 2008. What’s extraordinary to recall about the immediate aftermath of the great crash is the temporary reversal of those policies that had dominated the previous two decades. At the G20 summit in April 2009 hosted by British Prime Minister Gordon Brown, heads of state envisaged a return to Keynesian macroeconomic prescriptions, including a large-scale fiscal stimulus in both developed and developing countries. It appeared that the Washington Consensus had suddenly lost all legitimacy. The liberalised global financial system had clearly failed to provide for a net transfer of resources to the developing world, or prevent instability and recurrent crisis without effective state regulation and democratic public oversight. Many civil society organisations saw the moment to call for fundamental reform of the Bretton Woods institutions, as well as a complete rethink of the role of the state in the economy. There was even talk of negotiating a new Bretton Woods agreement that re-regulates international capital flows, and supports policy diversity and multilateralism as a core principle (in direct contrast to the IMF’s discredited approach). The United Nations played a staunch role in upholding such demands, particularly through a commission set up by the then-President of the UN General Assembly, Miguel d’Escoto Brockmann. Led by Nobel laureate Joseph Stiglitz, the ‘UN Conference on the World Financial and Economic Crisis and its Impact on Development’ proposed a number of sensible measures to protect the least privileged citizens from the effects of the crisis, while giving developing countries greater influence in reforming the global economy. Around the same time, the UN Secretary-General endorsed a Global Green New Deal that could stimulate an economic recovery, combat poverty and avert dangerous climate change simultaneously. It envisioned a massive programme of direct public investments and other internationally-coordinated interventions, arguing that the time had come to transform the global economy for the greater benefit of people everywhere, including the millions living in poverty in developing and emerging industrial economies. This wasn’t the first time that nations were called upon to enact a full-scale reordering of global priorities in response to financial turmoil. At the onset of the ‘third world’ debt crisis in 1980, an Independent Commission on International Development Issues convened by the former West German Chancellor, Willy Brandt, also proposed far-reaching emergency measures to reform the global economic system and effectively bail out the world’s poor. Yet the Brandt Commission proposals were widely ignored by Western governments at the time, which marked the rise of the neoliberal counterrevolution in macroeconomic policy—and all the conditions that led to financial breakdown three decades later. Then once again, governments responded in precisely the opposite direction for bringing about a sustainable economic recovery based on principles of equity, justice, sharing and human rights. We are all familiar with the course of action taken from 2008-9: colossal bank bailouts enacted (without public consultation) that favoured creditors, not debtors, despite using taxpayer money. Quantitative easing (QE) programmes that have pumped trillions of dollars into the global financial system, unleashing a fresh wave of speculative investment and further widening income and wealth gaps. And the perceived blame for the crisis deflected towards excessive public spending, leading to fiscal austerity measures being rolled out across most countries—a ‘decade of adjustment’ that is projected to affect nearly 80 percent of the global population by 2020. To be sure, the ensuing policy responses across Europe were often compared to structural adjustment programmes imposed on developing countries in the 1980s and 1990s, when repayments to creditors of commercial banks similarly took precedence over measures to ensure social and economic recovery. The same pattern has repeated in every crisis-hit region, where the poorest in society pay the price through extreme austerity and the privatisation of public assets and services, despite being the least to blame for causing the crisis in the first place. After ten years of these policies a new billionaire is created every second day, banks are still paying out billions of dollars in bonuses each year, and the top 1% of the world population are far wealthier than before the crisis happened. At the same time, global income inequality has returned to 1820 levels, and indicators suggest progress is now reversing on the prevention of extreme poverty and multiple forms of malnutrition. Indeed the United Nations continues to face the worst humanitarian situation since the second world war, in large part due to conflict-driven crises that are rooted in the economic fallout of the 2008 crash—most dramatically in Syria, Libya, and Yemen. Countries of both the Global North and South remain in the grip of a record upsurge of forced human displacement, to which governments are predictably failing to respond to in the direction of cooperative burden sharing through agreements and institutions at the international level. Not to mention the rise of fascism and divisive populism that is escalating in almost every society, often as a misguided response to pervasive inequality and a widespread sense of unfairness among ordinary workers. It is surely reasonable to suggest that all these trends would not be deteriorating if the community of nations had seized the opportunity a decade ago, and acted in accordance with calls for a just transition to a more equitable world order. We now live in a strange era of political limbo. Neoclassical economics may have failed to predict the great crash or provide answers for a sustained recovery, yet it still retains its hold on conventional academic thought. Neoliberalism may also be discredited as the dominant political and economic paradigm, yet mainstream institutions like the IMF and OECD still embrace the fundamentals of free market orthodoxy and countenance no meaningful alternative. Consequently, the new regulatory initiatives agreed at the global level are largely voluntary and inadequate, and governments have done little to counter the power of oligopolistic banks or prevent reckless speculative behaviour. Banks may be relatively safer and possess a bigger crisis toolkit, but the risk has moved to the largely unregulated shadow banking system which has massively increased in size, growing from $28 trillion in 2010 to $45 trillion in 2018. Even major banks like JP Morgan are forewarning an imminent crisis, which may be caused by a digital ‘flash crash’ in which high frequency investments (measuring trades in millionths of a second) lead to a sudden downfall of global stock markets. Another probable cause is the precipitous rise in global debt, which has soared from $142 to $250 trillion since 2008, three times the combined income of every nation. Global markets are running on easy money and credit, leading to a debt build-up which economists from across the political spectrum agree cannot last indefinitely without catastrophic results. The problem is most acute in emerging and developing economies, where short-term capital flowed in response to low interest rates and QE policies in the West. As the US and other rich countries begin to steadily raise interest rates again, there is a risk of a mass exodus of capital from emerging markets that could trigger a renewed debt crisis in the world’s poorest countries. Of most concern is China, however, whose credit-fuelled expansion in the post-crash years has led to massive over-investment and national debt. With an overheating real-estate sector, volatile stock market and uncontrolled shadow banking system, it is a prime candidate to be the site for the next financial implosion. However it originates, all the evidence suggests that an economic collapse could be far worse this time around. The ‘too-big-to-fail’ problem remains critical, with the biggest US banks owning more deposits, assets and cash than ever before. And with interest rates at historic lows for many G-10 central banks while the QE taps are still turned on, both developed and developing countries have less policy and fiscal space to respond to another shock. Above all, China and the US are not in a position to take the same decisive central bank action that helped avert a world depression in 2008. And then there are all the contemporary political factors that mitigate against a coordinated international response—the retreat from multilateralism, the disintegration of established geopolitical structures and relationships, the fragmentation and polarisation of political systems throughout the world. After two years of a US presidency that recklessly scraps global agreements and instigates trade wars, it is hard to imagine a repeat of the G20 gathering in 2009 when assembled leaders pledged never to go down the road of protectionist tariff policies again, fearing a return to the dire economic conditions that led to a world war in the 1930s. The domestic policies of the Trump administration are also especially perturbing, considering its current push for greater deregulation of the financial sector—rolling back the Dodd-Frank and consumer protection acts, increasing the speed of the revolving door between Wall Street and Washington, D.C., and more. None of this is a reason to despair or lose hope. The great crash has opened up a new awareness and energy for a better society that brings finance under popular control, as a servant to the public and no longer its master. Many different movements and campaigns have sprung up in the post-crash years that focus on addressing the problems wrought by financialisation, which more and more people realise is the underlying source of most of the world’s interlinking crises. All of these developments are hugely important, although the true test of this rising political consciousness will come when the next crash happens. After the worldwide bank bailouts of 2008-9—estimated in excess of $29 trillion by the US Federal Reserve alone—it is no longer possible to argue that governments cannot afford to provide for the basic necessities of everyone. Just a fraction of that sum would be enough to end income poverty for the 10% of the global population who live on less than $1.90 a day. Not to mention the trillions of dollars, euros, pounds and yen that have been directly pumped into financial markets by central banks of the major developed economies, constituting a regressive form of distribution in favour of the already wealthy that could have been converted into some form of ‘quantitative easing for the people’. A reversal of government priorities on this scale is clearly not going to be led by the political class. They have already missed the opportunity, and are largely beholden to vested interests that are unduly concerned with short-term profit maximisation, not the rebuilding of the public realm or the universal provision of essential goods and services. The great crash and its aftermath was a global phenomenon that called for a cooperative global response, yet the necessary vision from within the ranks of our governments was woefully lacking. If the financial crisis resurfaces in a different and severer manifestation, we the people will have to fill the vacuum in political leadership. It will call for a monumental mobilisation of citizens from below, focused on a single and unifying demand for a people’s bailout across the world. Much inspiration can be drawn from the popular uprisings throughout 2011 and 2012, although the Arab Spring and Occupy movements were unable to sustain the momentum for change without a clear agenda that is truly international in scope, and attentive to the needs of the world’s majority poor. That is why we should coalesce our voices around Article 25 of the Universal Declaration of Human Rights, which proclaims the right of everyone to the minimal requirements for a dignified life—adequate food, housing, medical care, access to social services and financial security. Through ceaseless demonstrations in all countries that continue day and night, a united call for implementing Article 25 worldwide may finally impel governments to cooperate at the highest level, and rewrite the rules of the international economic system on the basis of shared mutual interests. In the wake of a breakdown of the entire international financial and economic order, such a grassroots mobilisation of numberless people may be the last chance we have of resurrecting long-forgotten proposals in the UN archives, as notably embodied in the aforementioned Brandt Report or Stiglitz Commission. The case of Iceland is widely remembered as an example of how a people’s bailout can be achieved, following the ‘Pots and Pans Revolution’ that swept the country in 2009—the largest protests in the country’s history to date. As a result of the public’s demands, a new coalition government was able to buck all trends by avoiding austerity measures, actively intervening in capital markets and strengthening social programs for the less privileged. The results were remarkable for Iceland’s economic recovery, which was achieved without forcing society as a whole to pay for the blunders of corrupt banks. But it still wasn’t enough to prevent the old establishment political parties from eventually returning to power, and resuming their support for the same neoliberal policies that generated the crisis. So what must happen if another systemic banking collapse occurs of even greater magnitude, not only in Iceland but in every country of the world? That is the moment when we’ll need a global Pots and Pans Revolution that is replicated by citizens of all nationalities and political persuasions, on and on until the entire planet is engulfed in a wave of peaceful demonstrations with a common cause. It will require a huge resurgence of the goodwill and staying power that once animated Occupy encampments, although this time focused on a more inclusive and universal demand for implementing Article 25 and sharing the world’s resources. It may seem far-fetched to presume such an unprecedented awakening of a disillusioned populace, as if we can expect a visionary leader of Christ-like stature to point out the path towards resurrecting the UN’s founding ideals of “better standards of life for everyone in the world”. Unfortunately, nothing less may suffice in this age of economic chaos and confusion, so let us all be prepared for the climactic events about to take place. Adam W. Parsons is the editor of Share the World’s Resources (STWR), an NGO campaigning for global economic and social justice based upon the principle of sharing. He can be reached at: adam@sharing.org. Read other articles by Adam, or visit Adam's website. This article was posted on Friday, October 12th, 2018 at 12:19am and is filed under 2008 Financial Collapse, Activism, Austerity, China, Economy/Economics, Fascism, Federal Reserve, Global Inequality, Human Rights, Iceland, IMF, Neoliberalism, Occupy movement, Social Movements, United Nations, United States, Wall Street, World Bank.